WASHINGTON, D.C. – Steve King again tried to explain his alleged White Supremacy remarks that he gave the author of a New York Times article, explaining to Congress the “context” of his statements. He says the interview was a “mistake” with “no tape”. 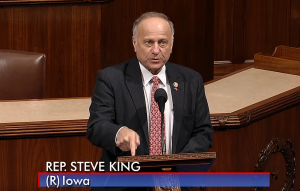 Congressman Steve King on Friday released the following video of remarks he delivered on the House floor today addressing recent comments appearing in The New York Times. This statement comes the day after another statement released by Iowa’s 4th District Congressman and as Republican challengers begin to come out and announce candidacies for his seat in the House of Representatives. The Times article basically called King a liar and that he disparaged illegal “immigrants” (aliens) and champions “Western Civilization” (so-called White Supremacy) with nuanced words and phrases or outright insults. Well in all honesty it WAS DA whiteys that Established America and made it a wonderful place to live . Nothing against the mexs/kenyons/or Africaicans – but the oceans flows both ways so set sail if your displeased or not able to get government handouts we say.